At RST Midlands, we provide a wide range of roofing services to commercial, industrial and domestic customers at highly competitive rates. Whether you would like a new driveway or are considering a property extension, the team at RST Midlands will meet your requirements. Click here to view our range of previously completed roofing projects and building work, clicking on each thumbnail for a larger image. 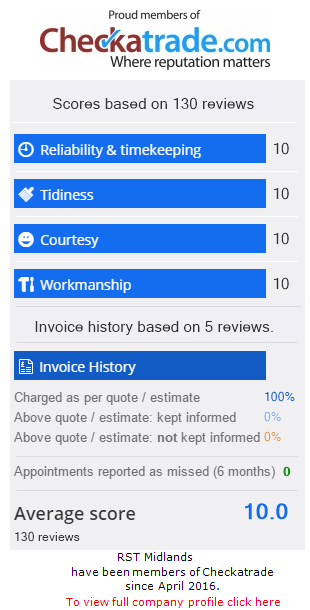 Arrange your free, no obligation quotation today on: 01827 873 337 and a member of our team will be happy to assist you. Welcome to RST Midlands, specialists in a wide range of building and roofing services in Tamworth and the surrounding areas of Atherstone, Nuneaton, Sutton Coldfield and Birmingham. A family business that has been trading for over 30 years, we undertake all types of roofing and building work including tiling, slating, EDPM, roof repairs and flat roof installations, as well as general building work, driveway installations, conservatories, groundworks and building maintenance amongst many others. Our tradesmen and roofing contractors are fully qualified, providing added peace of mind to our clients whilst ensuring all projects are completed to the highest of standards. Whether you’re considering a new driveway or require a small roof repair, we offer free quotations to all prospective customers as standard. Contact us today on: 01827 873 337 and a member of our team will happily arrange a free site visit at your nearest convenience. With years of industry experience, our builders and roofing contractors are on hand to offer valuable advice about the proposed work, answering any questions you may have. A written quotation will then be provided for your consideration, free from obligation.